Pure Steel Records are excited to announce the Official release date of the of the new album "Commander OF Pain" , the spectacular, all-star project headed by Austria's rock legend Klaus Schubert, is set for June 29, 2018. The pre-order phase will begin on June 15th, 2018 through the Pure Steel Records Web Shop. The album will be made available on CD and other Media formats which will soon be announced. SCHUBERT IN ROCK, inaugurated by Klaus Schubert, lead guitarist and mastermind of NO BROS, is taking what was established and is now going to the next level. Back in 2013, Schubert assembled some of the most legendary international rock artists and long-time friends to record new versions of NO BROS' greatest hits. Among those previously featured were Tony Martin (BLACK SABBATH), Biff Byford (SAXON), Joe Lynn Turner (RAINBOW, DEEP PURPLE), Marc Storace (KROKUS), Doogie White (RAINBOW), Bernie Marsden (WHITESNAKE), Neil Murray (BLACK SABBATH, BRIAN MAY) and Don Airey (DEEP PURPLE). The riveting project turned out to be a huge success and culminated in a sensational sell-out show at the Congress concert hall in Innsbruck. Much like the first self-titled album, the new "Commander of Pain" project will feature some of the world's most celebrated Artists and musicians, making for, yet, another milestone in Austrian Rock Music. "Commander of Pain" will introduce entirely new songs, all of them tailor-made for each artist while remaining true to SCHUBERTs distinctive sonic signature. Special Guest Artists Line-Up; Marc Storace (KROKUS), Don Airey (DEEP PURPLE), Jennifer Batten (MICHAEL JACKSON, JEFF BECK), Carl Sentance (Current NAZARETH Singer), Jeff Scott Soto (SONS OF APOLLO, JOURNEY, TRANS-SIBERIAN ORCHESTRA), Doogie White (RAINBOW, MICHAEL SCHENKER), Michael Vescera (Y. J. MALMSTEEN, LOUDNESS, OBSESSION), Dan McCafferty (Former NAZARETH Singer) as well as Austrian artist Ewald Pfleger from the international chart-breaking band OPUS. SCHUBERT IN ROCK Main Line-Up: Klaus Schubert (guitars), Walt Stuefer (Vocals), Andy Marberger (Bass guitar, backing vocals), Bernie Welz (drums) and Andy J. Brunner (keyboards). Legendary guitarist Michael Schenker (UFO, Scorpions, MSG) and two of his bandmates from Michael Schenker's Temple of Rock, Herman Rarebell (ex Scorpions) and Doogie White (ex Ritchie Blackmore's Rainbow) are interviewed on this week's show. All 3 members choose songs from their current album 'Spirit On A Mission', along with tracks from previous bands. First up, Michael tells fans what they can expect from the setlist on the band's UK tour in January 2016 (full dates at http://www.michaelschenkerhimself.com/tour.php ), and also discusses the band's forthcoming third album, and his longterm vision for Temple of Rock. You'll also hear Michael's choice of a classic Scorpions song. Doogie White then celebrates the 20th anniversary of the album he recorded with Ritchie Blackmore's Rainbow, 'Stranger In Us All', choosing 2 songs and looking back on how he came to join the band, giving an insight into the writing, recording and tour for the album. Doogie also pays tribute to original Rainbow vocalist Ronnie James Dio, and chooses 2 of his favourite songs from Ronnie's tenure with the band. The Temple of Rock triple threat concludes with drummer Herman Rarebell, who begins the first in a series of 7 interviews covering the newly released remastered reissues of 8 classic Scorpions albums on SPV Records. Herman tells how he came to join the band in 1977 and shares his memories of the recording and tours for the 'Taken By Force' and 'Tokyo Tapes' albums and Uli Jon Roth's departure from the group. Herman also selects two songs from each record. The award-winning, legendary guitarist Michael Schenker will embark on a nationwide UK tour with his band Temple of Rock starting at the Bilston Robin in Wolverhampton on Wednesday 20th January 2016. A 48-Hour Planet Rock ticket pre-sale starts at 9am on Wednesday 29th April at www.planetrock.com. Tickets will be available to the general public on Friday 1st May via www.thegigcartel.com and the 24-hour box office: 0844 478 0898. Schenker will perform tracks from his current studio album Spirit On A Mission which features the singles Vigilante Man and Live and Let Live. 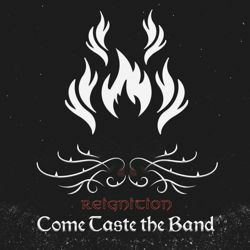 Spirit On A Mission is a rapturous, explosive collection of brand new songs steeped in shades of dark and light. Musically and lyrically, the new album shows a re-energised guitarist at the top of his game, surrounded by some of the best musicians in rock. The new album features twelve classic rock guitar-driven songs that highlight Schenker’s distinctive and dynamic guitar playing, valiantly underpinned by the ferocious rhythm section of Herman Rarebell and Francis Buchholz, the same rhythm section that originally performed together on the Scorpions’ 1979 album Lovedrive. Scottish vocalist Doogie White, who co-wrote the album with Schenker, soars across every song, and stamps his personality with every note and phrase, while Wayne Findlay adds a new level to Schenker’s classic sound with his Dean 7-string guitar and keyboard arrangements. LEGENDARY GUITARIST MICHAEL SCHENKER ANNOUNCES SPRING NORTH AMERICAN TOUR! Few rock guitarists have as impressive a resume as Michael Schenker does - as he has supplied his six-string talents to such world-renowned acts as the Scorpions, UFO, and the Michael Schenker Group over the years. And it is now confirmed that Schenker will be touring North America come the spring, in support of his killer new disc, 'Spirit on a Mission,' released March 24, 2015. Michael Schenker's Temple of Rock line-up proves to be one of the strongest that the German guitarist has ever played with, as it features the former Scorpions "Rock You Like A Hurricane" rhythm section of Francis Buchholz (bass) and Herman Rarebell (drums), as well as Doogie White (vocals, formerly of Rainbow), and Wayne Findlay (guitar/keyboards, and longtime Michael Schenker Group member). The tour kicks off on March 25th at the Rockbar Theater in San Jose, CA (the day after the release of 'Spirit on a Mission'), and wraps up on May 2nd at the Canyon Club in Agoura Hills, CA (with special guest Don Dokken on the bill). In between, the tour will go coast to coast, including a performance at the Gramercy Theatre in NYC on April 15th. Undoubtedly, this set of North American dates are the first step towards establishing Michael Schenker's Temple of Rock as a global force. Gundriver opening act for entire tour. Award-winning, legendary guitarist Michael Schenker releases a new studio album entitled "Spirit On A Mission" in the UK on Monday 23rd March. Released by in-akustik, the album of all-new material features Schenker’s Temple of Rock band - ex-Scorpions Herman Rarebell (drums) and Francis Buchholz (bass), ex-Rainbow’s Doogie White (vocals) and Wayne Findlay (guitar, keyboards). The new album features twelve 12 classic rock guitar-driven songs that highlight Schenker’s distinctive and dynamic guitar playing, valiantly underpinned by the ferocious rhythm section of Rarebell and Buchholz, the same rhythm section that originally performed together on the Scorpions’ 1979 album Lovedrive. Michael remembers how he came up with the name of the new album - "A while ago I was asked how I wanted to be remembered, and I said ‘as a spirit on a mission, spreading the joy of music from a place of pure self expression." The new album was recorded at Kidroom Studios, Muenster, Germany; the same studio where 2013’s Bridge The Gap album was recorded. The album was produced by Michael Voss and Michael Schenker, and engineered by Voss. "After the Bridge The Gap Japan Tour in March 2014, I started to put new material together for what was to become the Spirit On A Mission album," says Schenker. I went to the recording studio in June 2014 to put down the song arrangements and we finished recording in November." During the recording of the new album, the original recordings and guitars were stolen from the recording studio. Did this impact on the recording process of the new album? "Yes we got robbed (some guitars and some music) and got very upset about it," recalls Schenker. "Fortunately it was just performances and not compositions. We caught up and performed the music better than before. It forced us to work extra hard and longer but it made it stronger." For Schenker, the songwriting and recording process for Spirit On A Mission was very different from the 2012’s Bridge The Gap album. Says Schenker - "I already knew ahead of time that I wanted to take Spirit On A Mission to the next level by adding more 7-string guitar on some songs to get more of the low heavy sound, and on other songs to keep it very fast and energetic with melodic vocals and a couple of mid tempo’s with more of my writing like in my UFO days." "Doogie did an amazing job with his melodies and singing," adds Schenker. "Even though we had our instruments, music and equipment stolen from the recording studio, we had to re-record a lot of his vocals again, but when we did it the second time around, it got even better." "I asked Wayne to come up with a few cool guitar riffs on his 7 string. I added my parts to it and the outcome was very unique. Again, with the addition of Doogie’s vocals, we entered a whole new place that was an extreme pleasurable experience." The writing process and overall concept for Spirit On A Mission proved to be a fulfilling experience for Schenker and his band. Says Schenker - "I always write in the same way but this time, especially driven by a precise concept." The picture was album balance for me and combine many years of emotions in one. I wanted lots of double bass drum to keep the fast songs rolling like a train with lots of energy covered with interesting elements, a couple of my UFO days-type of mid tempos and the 7 string low sound to get a very wide range of sounds and emotions." Doogie White & Michael Schenker. Photo Credit: © John Bull. Michael’s Temple of Rock shared ideas and collaborated in a bigger way on the new album. "All songs were co-written by Doogie and myself, "recalls Schenker. "Wayne co-wrote five songs. I originally wanted to write the album as a group effort, but I had this concept that needed to be focused on differently. However, Herman and Francis did very well by adding there amazing Rock You Like A Hurricane rhythm section parts that gave it all it needed. The new album also sees guitarist and keyboard player, Wayne Findlay, takes on a bigger role. "Wayne has been with me (MSG) since 1999," says Schenker. "In 2004, I met Dean Guitars and they built me a 7 string. I played it for a while but thought it was too much of a sidetrack from what I was doing." "I always liked that low sound and asked Wayne to look into developing it on the 7 string. A couple of years ago we started to use a bit of Wayne’s 7 string guitar on Bridge The Gap as a slow introduction. Wayne looks like a Neptune (Ocean God) and he loves the ocean. I saw this as an opportunity to have Dean build him a Trident Guitar in order to make his character complete. I wrote a little piece about Wayne called Neptune Rising on the Bridge The Gap album and now on Spirit On A Mission Wayne was ready to co-write five songs, and has now become an essential part of Temple Of Rock." "Coincidentally," says Schenker, "former Scorpions members Herman Rarebell and Francis Buchholz and myself were out of the loop of rock’n’roll around the same time, but for different reasons. When we recorded 2013’s Bridge The Gap album, we had not played together since the Scorpions’ Lovedrive album (1979). Sprit On A Mission is the second Temple of Rock album to feature the former Scorpions rhythm section. Former Rainbow singer Doogie White is described by Schenker as an "extremely creative individual with a fantastic range and a voice that never stops". "How many people do you know that can sing nine shows in a row, without a day off and still have a voice with a range like his?" says Schenker. "He’s a real trooper." Wayne Findlay, Michael Schenker & Francis Buchholz. Photo Credit: © Adam Kennedy. What are Schenker’s favourite songs from Spirit On A Mission, and why? Says Michael – "I love Live and Let Live because it has everything. I love Vigilante Man because it’s heavy and melodic with a great tempo and sound. Something Of The Night turned out to be a fantastic outcome especially with that spooky Howler sound I developed awhile ago. Saviour Machine is an epic. Rock City, Bullet Proof, Restless Heart - I love the fast melodic stuff, and the other 7 string songs with a touch of ’70s rock." 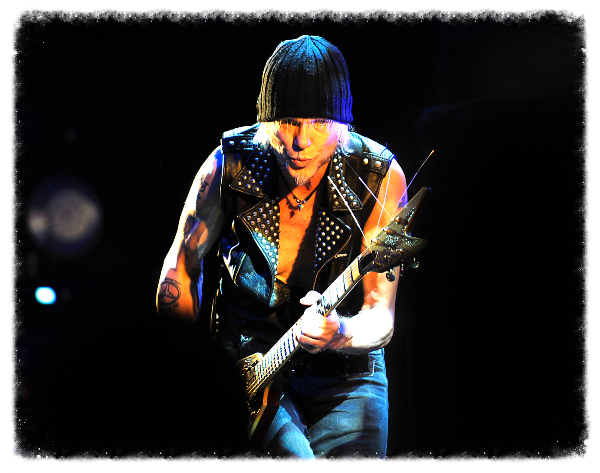 What are Schenker’s overall plans to promote the new album? Does he plan on touring the album by relentless touring and playing summer festivals? "Promotion is definitely the next step," says Schenker. "and tour-wise, including Festivals, we will play wherever we can to promote "Spirit On A Mission". I want to make Temple Of Rock its own entity. Right now it is still using the Michael Schenker platform but eventually I want it to stand on its own feet as ‘Temple Of Rock’. Wayne Findlay, Francis Buchholz, Doogie White, Herman Rarebell & Michael Schenker. Photo Credit: © John Bull. Michael Schenker is proud to announce specials guests for the "Bridge the Gap" tour will be Bournemouth Rockers Western Sand. 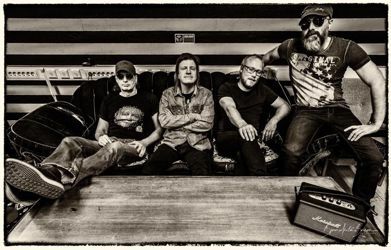 At O2 Shepherd’s Bush Empire on 20th December - in addition to Western Sand - the phenomenal State Villains featuring Michael’s son, Tyson Schenker on guitar, will be opening up the show. Schenker will perform tracks from his current studio album "Bridge The Gap" which features the new single "Lord Of The Lost And Lonely". Bridge The Gap features Schenker’s Temple of Rock band, comprising ex-Scorpions Herman Rarebell (drums) and Francis Buchholz (bass), ex-Rainbow vocalist Doogie White and Wayne Findlay (guitar, keyboards). "I sent material to Doogie in the New Year and he started writing melodies and lyrics," says Schenker. There was a lot of energy flying about during the recording process. I had the same drive making this album as I had when I was 16. I wanted it fast, heavy and melodic. It felt like bridging the gap from my teenage and Lovedrive years to what I am doing now. I’m back to where I was a long time ago and I love it." "Never having really written with Michael before, apart from When the Devil Knows You’re Dead (from 2011’s Temple of Rock album), I didn’t know how flexible he would be writing wise," recalls Doogie." I recorded some vocal tracks as ideas and when Michael heard them we were off and running. Within two weeks we were in the studio laying down tracks." "I wanted to combine the old with the new," says Schenker. "That’s why the album’s called Bridge The Gap. With Wayne playing 7 string guitar we created some low, heavy modern sounds. Since I play and experiment on a regular basis, I always have some new, fresh sparks to share when I record a new album. I am inspired from within. It’s infinite like a kaleidoscope." "As former members of the Scorpions, Herman, Francis and I have been out of the loop of rock’n’roll for quite a while. Getting together for the first time since the Lovedrive album is an incredible jump. We’re connecting the past with the present. We’re bridging the gap." "Everything that is currently going on in this world is showing that people are desperate for change. We need to bridge the gap of poverty. There are too many innocent people getting killed in terrorist attacks. We need to leave all of this chaos behind us. We have to be strong. We have to continue moving forward, working together in a balanced way." "I came up with the name of the album, before I even started writing. When Doogie started writing the lyrics to the new songs he had something to go by." Schenker liked his voice and asked Voss if he wanted to do the singing. When Schenker finished the demo he played it to Pete and Herman. They liked what they heard and immediately offered to become the rhythm section. The result was 2011’s "Temple Of Rock" album which featured guest musicians including Star Trek’s Captain Kirk (William Shatner) who recorded the spoken word intro on the album. Schenker ended up playing on Shatner’s solo album. Vocalist Doogie White also appeared on the album. Schenker wrote a song specially suited for Doogie’s vocals - "Before The Devil Knows You’re Dead". The band toured for another three months in Europe and grew stronger. After finishing the second part of the tour, they got back together and remixed and re-mastered the album. Entitled "Bridge The Gap", the album will be released December 2nd 2013. In 2014, Michael Schenker’s Temple of Rock will embark on a North American tour. "We’re ready to rock," says Schenker. Multinational Melodic Metal band and AFM Records act, Eden's Curse, were joined onstage at Camden Underworld, London by former Rainbow, Yngwie Malmsteen and current Michael Schenker vocalist Doogie White. White, who contributed guest backing vocals to the groups 2007 self-titled debut and 2008's sophomore release, "The Second Coming", joined new Curse vocalist Nikola Mijic (Alogia, Dreyelands) for a duet on their 2011 YouTube hit "No Holy Man". "No Holy Man" was the lead single from the groups third album, "Trinity", which featured Dream Theater vocalist James LaBrie on guest lead vocals. Eden's Curse have just completed a successful seven date debut headline club tour of the UK in support of their latest album "Symphony Of Sin", with the grand finale being the show at the infamous club in the English capital. 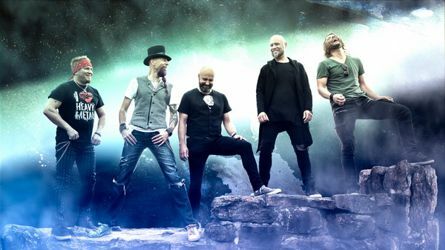 The band, consisting of Nikola Mijic (vocals), Thorsten Koehne (guitar), Paul Logue (bass) and John Clelland (drums), will begin writing their fifth studio album towards the end of the Summer and are already putting plans in place to return to the UK towards the end of the year, as well as working on additional European dates.